Here at Unmistakably Star Wars, we’ve covered the serious aspects of the Thrawn novel. We have reviewed it and discussed it. One idiot even postulated the crazy idea that Ahsoka was in one of the scenes. Timothy Zahn has summarily dismissed that conjecture. With all the time we’ve devoted to it, there is still much we have not touched. What we never got around to was the fun little nuggets Zahn included in the book. These items are not important to the overall story, but they are nice little winks to the audience. I want to take just a little time to mention these entertaining moments and see if anyone else caught them. Early in the novel, Thrawn is given his first Lieutenant rank insignia. He discusses with his translator, Eli Vanto, ways he could imbed technology in the insignia. The two quickly begin to discuss the advantages of having a communication device placed in a hollowed out section of the insignia. How convenient would it be for members of the military to have a communicator in such an easily accessible place? Sound familiar? However, the excitement is soon dashed. Vanto realizes that there is not enough room in the insignia for a battery large enough to give the communicator much range, making the communicator useful only within a ship. It couldn’t be used, for instance, to communicate from an orbiting ship to the planet below or to lock on a signal to beam crew members back to the ship, if the Imperial navy did any beaming, that is. At graduation from the Royal Imperial Academy, Thrawn meets Vanto’s parents. Being Chiss, a species of only mythic reputation, Vanto’s parents know nothing factual about the type of being Thrawn is. Their idea of him is only informed by rumors. One one point, Vanto’s mother asks which legends about the Chiss are true. “Only the good ones,” Thrawn jokes. He then goes on to clarify his position, which is legends can be important, even if they aren’t true. I think Zahn is saying that the Star Wars books not in canon can still be enjoyed. It would impossible for new books to keep from contradicting something in the immense extended universe, and starting from scratch is the only way to give new artists freedom to take stories where they need to go. So if you like Legends books, keep reading them. Plus, buying them helps put a little more money in his pocket. 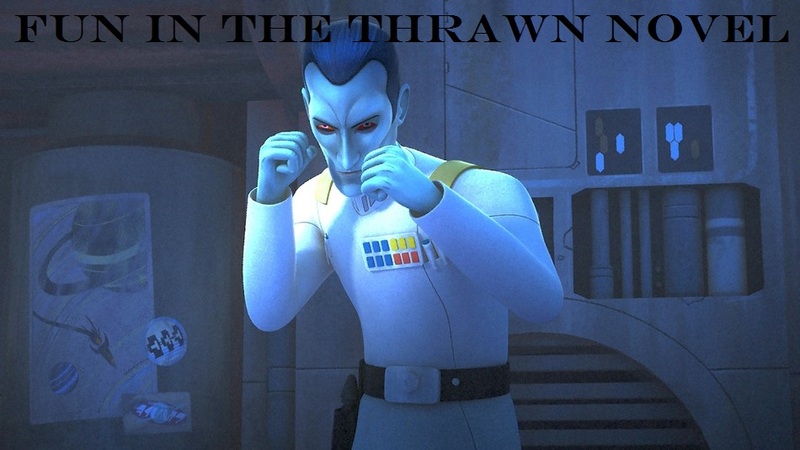 Later in the novel, Thrawn has to resolve a territorial dispute between humans and an alien species. The voice of the alien species is described as all at once grating, whining, and melodious. My question to each reader is how did you imagine the voice? Did you try to fit all three adjectives into the way you imagined the voice, or did you just imagine it the same way as all the other voices sound in your head? Unlike the readers, the narrator for the audio books had no choice of whether to come up with a way to make the voice sound as described. I wonder if Zahn knew how hard it would be to make a voice sound like that and did it just to give the narrator a hard time. I imagine the disgust Marc Thompson felt when he first realized he had to create such a voice. I will say, he rose to the challenge. The voice was as advertised, which actually made that part of the book difficult to listen to. I’m sure there are other small details which eagle-eyed readers noticed. What did I miss? Tell us the parts that others may not have noticed but delighted you.